PC gamers are accustomed to waiting. High-profile titles often arrive months after an initial console release, and when it comes to hardware we tend to delay our purchasing decisions because, as you well know, there's always something better waiting just around the corner. And there's usually good reason to hold out that little bit longer. In terms of premium gaming laptops, enthusiasts have been sitting patiently over the last few months as they await the right system outfitted with a sixth-generation Intel Core processor, codenamed Skylake. Industry stalwart Gigabyte reckons that wait is over with the P35X v5. As the name suggests, this is Gigabyte's fifth revision of the 15.6in P35X and from the outside it doesn't seem as though much has changed. The chassis continues to look impressively sleek for a device aimed primarily at gamers, and at 20.9mm at its thickest point, the build conforms to our expectations of a modern gaming machine. A weight of 2.4kg makes it heavier than your average laptop, but it's the £1,700 price tag that sets the P35X apart as a gaming PC. For that amount of money you might expect a unibody frame carved from a single piece of metal, yet as is often the case with premium gaming laptops, what we have is a blend of aluminium and plastic that combines to create a decent-but-not-spectacular finish. For Gigabyte's fans the P35 chassis is a known quantity, and the out-the-box experience will feel familiar. The lip on the edge of the lid makes it easy to open, the hinges are suitably stiff and allow for the display to be pushed back roughly 160º, and the keyboard with integrated numpad looks inviting. 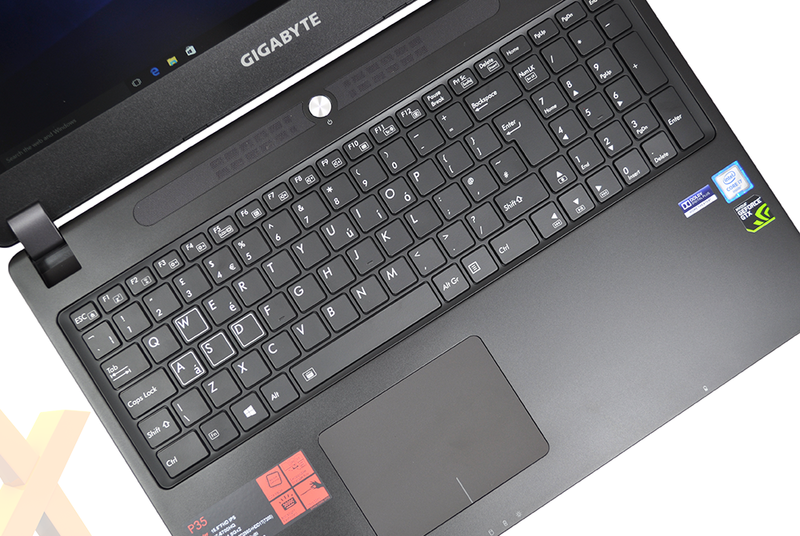 It's nice to see a gaming laptop presented without the usual garishness, however Gigabyte could still go further. The bezel surrounding the display is thick by today's standards and it's remarkable how such an inconsequential element can make a design appear dated. And the display itself is short on wow factor. In the base specification, Gigabyte uses an IPS panel from LG that touts a full-HD 1,920x1,080 resolution combined with good viewing angles and an anti-glare coating that helps keep reflections down to a minimum. Brightness and contrast are both respectable, however there's a lack of headline features, with the likes of touch sensitivity and G-Sync adaptive framerate missing from the specification sheet. What's interesting is that an alternative P35X v5 model is being brought to market with a 4K UHD display, and the superior resolution is expected to raise system price to £1,760. Audio output, meanwhile, is powered by upward-facing stereo speakers that deliver a surprising amount of punch. There's little bass to speak of, and the output is inevitably tinny, yet clarity is decent and there's no shortage of volume. Just below the speakers and central power button is a backlit keyboard that's well-sized and able to squeeze in a dedicated numpad by shrinking the '0' key. The layout works just fine, however the keys offer little travel and our review sample exhibited noticeable flex in the top-left corner, near keys 1, 2 and 3. We've managed to write this review without any major issues, but the typing experience isn't anything to, well, write home about. Aligned centrally to the Space Bar is an Elan trackpad with integrated click points. The matte surface feels nice to the touch and though trackpads can be a sore point on many laptops, we didn't experience any obvious problems with this one - it's well-sized and responds quickly to single- or multi-touch gestures. Making good use of the available space, Gigabyte lines both sides of the chassis with an array of I/O ports. The left edge is home to Gigabit Ethernet, dual USB 3.0, headset and microphone jacks, and an SD card reader. Over on the right side you'll find a connector for the large 200W power supply, VGA, HDMI, USB Type-C, another USB 3.0 port and mini-DisplayPort. Many useful additions, though it's a shame Gigabyte doesn't take a cleaner approach with its software. 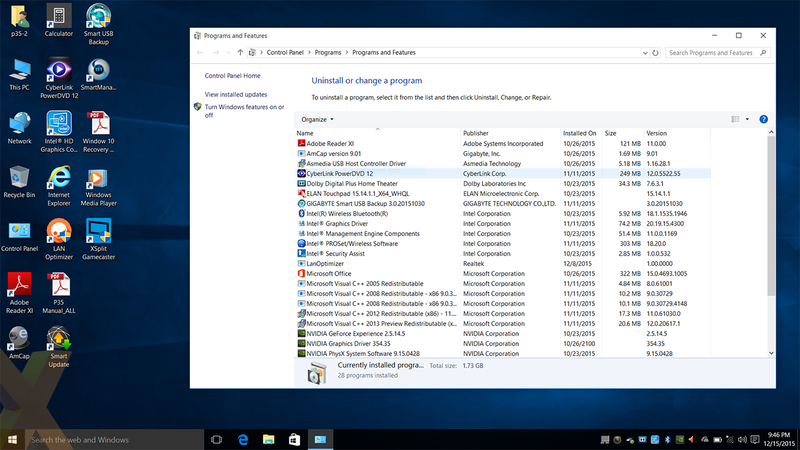 There actually isn't a lot of pre-loaded bloatware on top of the 64-bit Windows 10 install, but there are some frustrations. The desktop is unnecessarily cluttered with shortcuts - surely we could find Calculator on our own? - and LAN Optimiser, one of the installed utilities, has stopped working since we updated to the latest version of Windows 10 and now returns an error on every boot. 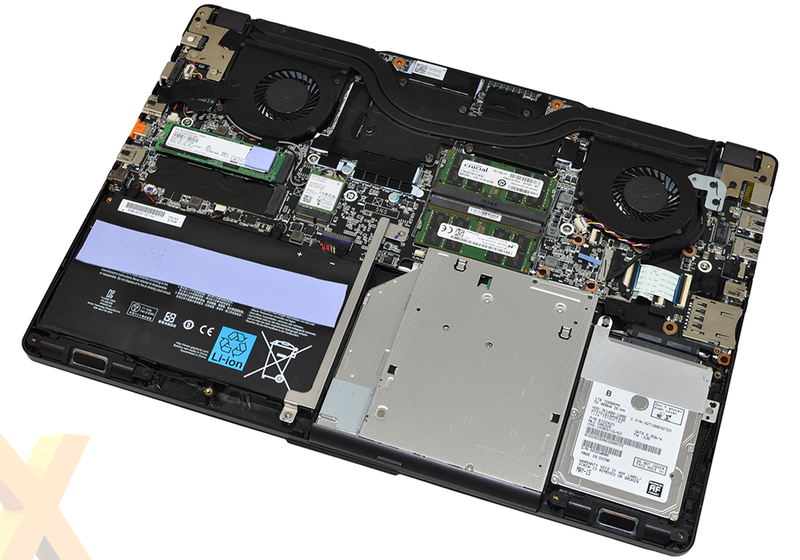 Of course, a laptop of this ilk is all about what lies under the hood. And there's plenty to get your teeth stuck into. At the helm is a quad-core Intel Core i7-6700HQ processor that's joined by 16GB (2x8GB) of DDR4 memory. The Intel chip provides integrated HD 530 Graphics for basic tasks, but for more strenuous workloads such as gaming there's a dedicated GeForce GTX 980M on tap with an 8GB frame buffer. Both processors are cooled by a dual-fan, dual-heatpipe design that exhausts hot air out of the rear of the chassis, leaving plenty of room for other components elsewhere. For storage, we have a 256GB Samsung SM951 NVMe M.2 drive in place as the system disk, with a 1TB 2.5in mechanical spinner serving as secondary storage. 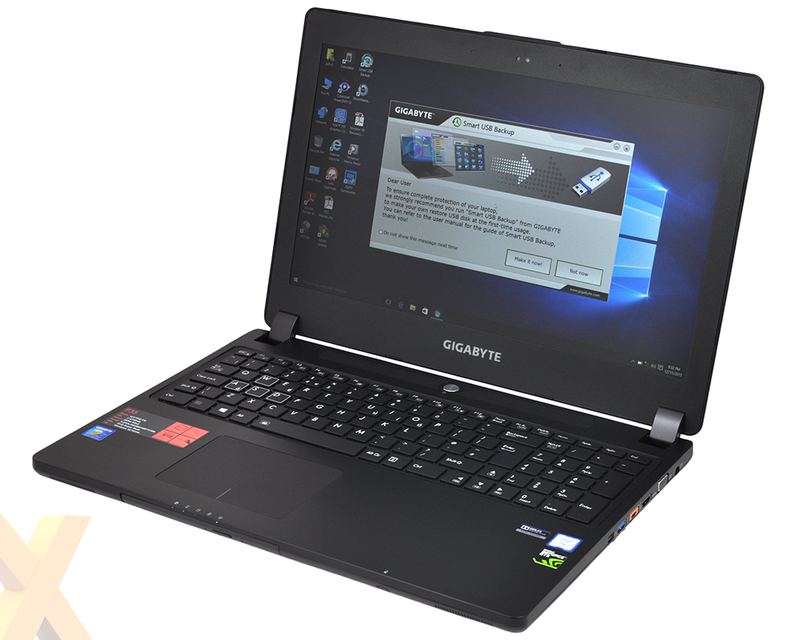 A dual-band Intel Wireless-AC 8260 adapter is on hand for WiFi duties, and Gigabyte has even managed to find room for an optical drive. The slim DVD writer ejects to the front of the laptop and there's a spare tray included in the box that can be used to replace the DVD drive with a 2.5in storage device, or be left empty in an effort to shave off some weight. With a latest-generation Intel chip, DDR4 memory, GTX 980M graphics and NVMe storage, the P35X v5 is just begging to be benchmarked. Let's oblige.